Brazil has declared three days of national mourning after a plane carrying the Chapecoense football team crashed in Colombia in the early hours of Tuesday, killing 75- footballers, journalists and crew members. Six of the 81 people on the plane – three footballers, two crew and a journalist – survived the disaster. Another footballer who was pulled alive from the plane’s wreckage died later in hospital. A Reuters photographer at the scene said dozens of bodies were laid out and covered with sheets around the wreckage, as about 30 rescuers, police and military personnel searched the muddy crash site. He said the plane had been split in two with only the nose and wings recognizable, and the tail end completely destroyed. 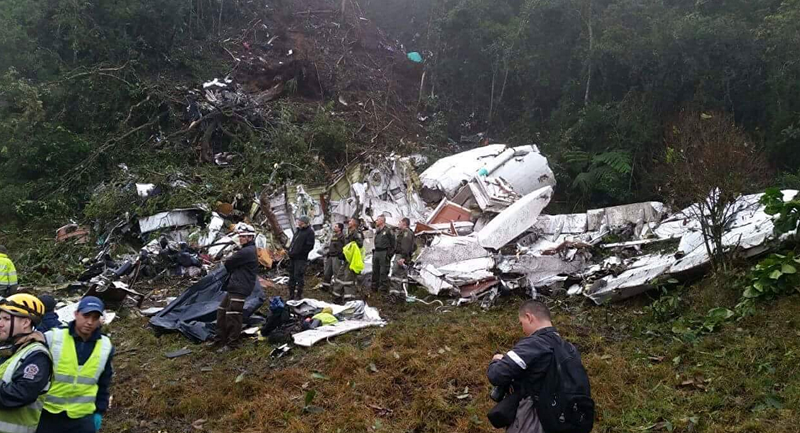 Colombian officials said 72 passengers and nine crew members were on board the charter flight, which started its journey in São Paulo, Brazil, on Monday afternoon and stopped over in Bolivia before heading for the Colombian city of Medellín, where the team had been due to play in the final of the Copa Sudamericana.